In Part 1, Nonna Petrova, a ballet school student in Kiev, was discovered by Yuri Mironov, a leading ballet dancer, and was taken to Leningrad to join the Kirov ballet school. After hard trainings, she danced Mordiana in a new ballet called "Arabesque". Yuri Mironov danced Alibaba as her partner. Nonna is in love with Yuri. Nonna Petrova is in the eighth grade of the Kirov ballet school in Leningrad. A new student called Veta arrives at the school and becomes Nonna's classmate. Veta is a new ballet dancer who Yuri Moronov has discovered in Hargitz. Veta is surprised to know Nonna is the one who played Mordiana. She says to Nanna, "I'll be more famous than you some day." On the same day when Veta arrives, Nonna meets Edik. He was Yuri's rival at the ballet school and is always dancing outside the Soviet Union as a famous demi-charactere dancer. Nonna's classmates say Veta didn't go to a ballet school in Hargitz but she worked for a factory. One of them asks Veta where she learned the art of ballet. "The ballet school is not the only place where ballerina comes from. " says Veta. Students are told to dance the part in "Fadetta" in a lesson. Only Veta can dance to the end. A teacher asks her if she often danced it in Hargitz. She answers she danced it only once four years ago. She says she never forgets how to dance whatever if she learns once. Her classmates wouldn't believe her. She says to them she can dance Mordiana because she watched the movie over and over. Yuri Mironov smiles to hear that. Nonna is shocked and cries, "Why don't you dance with Mr. Mironov?" Mironov asks if Veta would dance with him. They dance perfectly. Everyone is surprised to see Veta danced in quite the same manner as Nonna did. The ballet company and the ballet school students are preparing for a performance. Nonna is going to dance in a pas-de-trois in Swan Lake. She practices with Edik and she thinks his dance is very unique. She says to him "Mr. Mironov's hand goes where my hand goes, and your hand goes where you want my hand to go." "It's problematic." says Edic. Edic looks shocked. Nonna wonders why. At Korpakova's birthday party, Edik tells Yuri that he's come back to the Soviet Union because he wants to dance Alibaba in Arabesque. On the performance day, Nonna's close friend Asia is supposed to dance Odette and Odile in Swan Lake. She gets sick and a doctor says she's pregnant. Even though the doctor advises Asia shouldn't dance, Asia doesn't want give up dancing at the performance because it's a big chance for her. It's very difficult to find her substitute because Swan Lake is newly choreographed for this performance. Yuri Mironov asks Veta if she can substitute for Asia. Veta says yes. Asia ends up only dancing Odette, and Veta dances Odile part. The next day's newspaper praises both of them. The ballet school has decided to newly have the ninth grade. Yuri Mironov recommend Nonna be a ninth grader next year. Nonna would rather join the state Leningrad Kirov ballet theatre and she can't decide what to do. Students discuss on that. Only few of them can join the Kirov ballet theatre. It might be better for them to join a ballet company somewhere else. Someone asks Veta if she'll be the ninth grader. Veta says she's going to take the exam for joining the Kirov ballet theatre. "Do you dream you dance with Mr. Mironov?" asks one of the students. "Yes, I do. Something wrong with that?" answers Veta. Hearing that, Nonna decides not to be a ninth grader. She doesn't want Veta to become Mr. Mironov's partner. The ballet company is to have a special two-day performance for VIPs from Scandinavian countries. The president of the company calls Nonna to the theatre and tells her to dance Mordiana in Arabesque at the performance. When she comes back to the theatre in the evening to get something that she left there, she hears the music of "Arabesque". She looks into the stage and sees Edik dancing. It was a totally different choreography from the original, which Yuri Mironov danced. Yuri Mironov is watching him in the dark. He tells Edik his dance is so amazing that Yuri wants to kill him. On the first day of the performance, Veta asks Yuri Mironov to talk with the police on the phone because her younger sister was caught. Yuri goes out to talk with the police. He isn't back to the theater ten minutes before "Arabesque" is supposed to start. "Edik will dance Alibaba!" says Nonna. The president asks Edic to dance Alibaba. Edic says he needs 30 minutes to prepare for dancing Alibaba. He tells the president he will dance Alibaba if the president promises that he won't let Yuri dance Alibaba even if Yuri comes back within 30 minutes. The president promises it. Yuri comes back soon and he says to Edik "Good Luck!" Edik tells Nonna to dance as usual whatever style he dances in. Edik's new choreography of Alibaba makes a totally different Arabesque from the original even though Mordiana part's choreography hasn't changed at all. The new choreography is successful. The choreographer of the original Arabesque gets upset to see it. He reproaches Yuri for not dancing himself. Yuri talks back to him that Yuri is more shocked than him because it's not the choreographer's Alibaba but Yuri's Alibaba that were killed. Nonna says to Veta that it's Veta's responsibility that Mr. Mironov was not able to come back in time. Veta says she thought he was able to go back in time because the talk with the police only took five minutes. Edik overhears what Veta said and he learned Yuri didn't come back so Edik was able to dance Alibaba. The next day, Yuri Mironov and Nonna dance in Arabesque. Yuri has changed the choreography of Alibaba. Nonna is confused and she twisted her ankle while dancing. Veta dances Mordiana as her substitute. Nonna is so shocked that she can't walk even when her ankle gets better physically. Yuri Mironov sees her in the hospital and tells her he would do anything he can do and whatever Nonna wants him to do. Nonna's classmates say to her the dancers who performed in the two-day performance are going to visit the Scandinavian countries. She thinks she won't be able to take part in the tour as long as she can't walk. Edik comes to see Nonna in the hospital. He says Nonna is qualified to take part in the tour and he recommends she take part in the tour. He asks her if she only dances for Yuri. He says Nonna should dance for herself as Yuri does. He invites her to go to Belgium with him. He says he won't come back to the Soviet Union again. Nonna stays in Korpakova's place after leaving the hospital. One day, Veta calls on her. She says she belonged to a ballet club in Hargitz to practice ballet. She failed to enter a ballet school when she was ten years old because both her parents were fat. She has eight siblings and all the family members worked for a clock factory there. She practiced and practiced without any future prospects. So she was very happy when Yuri Mironov found her and took her to Leningrad. Even though she has something to say to Nonna, she leaves without saying that. Nonna goes to the theatre to see the graduation exam even though she can't take the exam. Students dance there and their dance is evaluated. Only the students who get very high point can join the Kirov ballet theatre. Nonna is surprised to know Veta is going to dance the title role of "A Hunchback Pony". It's what Donna was going to dance if she could walk. Nonna gets sick. Even though Yuri Mironov recommends Nonna watch her dance, Nonna insists on going home. Edik takes her home. Veta wanted to tell her in advance she was going to dance it, but she wasn't able to find a chance to tell. Edik says Yuri must have a reason for recommending that she should watch Veta's performance. Edik says Nonna must believe Yuri. On the other hand, he tells her he wants to take her to Belgium with him. He has no intention of forcing her to do that because Nonna has her family. Nonna is not sure she can leave her mother, her sister, her home country, and Yuri Mironov. Nonna gives a call to Yuri Mironov and tells him she wants to meet him next evening. Nonna's classmates visits her. They say two students are going to join the Kirov ballet theatre. They also say Veta can't join the Kirov ballet theatre, and that she's going to join a ballet theatre in Hargitsz. Veta calls on Nonna later. Nonna tells Veta she wonders why Veta can't join the Kirov ballet theatre. Both Nonna and Veta were discovered and taken to Leningrad by Yuri Mironov, so she believes Mironov wanted Veta to join the Kirov ballet theatre. Veta says she's just a handy dancer. She can dance Nonna's Mordiana, Asia's Odette. She can be someone else's substitute but she can't dance in her own way. The point of her dance of "A Hunchback Pony" was not bad, not good. Mironov recommended she be the ninth grader. However, her family expects her to become a professional dancer as soon as possible, so she has decided to join a ballet company in Hargitz. She says she's going to make every efforts there to become a superior dancer to Nonna. Nonna tells Mironov she's going to leave the Soviet Union for Belgium with Edik. The Kirov ballet theatre performs in Stockholm. When Edik and Nonna are in Nonna's room before going to the airport alone, Korpakova takes Yuri there. Seeing Edik and Nonna, Yuri lies to Korpakova that he's going out with them. At the airport, Yuri asks Edik why he wants to defect to the West. Yuri says Edik should wait for the day when he is respected as a pioneer and an outsider like him can live comfortably in the Soviet Union. Edik says he's waited long enough and can't wait any more. He wants to learn anything new and useful to him now in the West. He says if everyone has his or her home country beyond their race, his home country is not the Soviet Union, where he can't breathe. Nonna wishes she wanted to leave the country as much as Edik. Yuri Mironov looks very lonely to Nonna when he is going back alone. Nonna chases him. "Mr. Moronov!" cries Nonna. Yuri Mironov is surprised to see Nonna walking. Yuri hugs Nonna and says "Listen to me, Nonna. Even if you chase me, I can't do anything for you. I make you suffer." "I don't expect you to do anything for me. I'll follow you for all that." says Nonna. Edik leaves for Belgium alone. Hearing that Edik has defected to the West, Asia thinks Nonna has gone, too, because she found Nonna's ring in her pocket after she last met Nonna at the airport in Leningrad. Asia cries to see Nonna at the airport. Yuri Mironov is forbidden to perform on the stage for five months because he knew Edik's plan. The government doesn't know Nonna was with Edik. Nonna becomes the ninth grader. She meets Remir Brov at the studio. He is in the ninth grade, too. Nonna meets a beautiful German woman outside the studio. She is Karin Rubitz, a ballet pianist. She comes from Berlin to work for the ballet school. One morning, she comes late at school. She is drunken and falls in sleep during the lesson. Nonna takes her to the infirmary. Karin gives Nonna a piece of earring, which she says she doesn't need. For the five month when Yuri can't perform on the stage, he teaches pas de trois at the ballet school. Yuri hands a letter from Edik to Nonna. Edik says Yuri loves Nonna. Yuri says Edik's business goes well in the West and that all the record about him was deleted from the document in the Soviet Union, even from the graduate list of the ballet school where Yuri and Edic were. However, he says, he and Nonna will never forget him, and that he's sure all the world will call his name soon. Nonna has made the earring given by Karin a pendant head. She showed it to Karin. "Why on earth do you have it?" cries Karin, and pulls the pendant head with all her power. Some days later, she makes an apology for that. She says she forgets what happens when she is drunken. She gives the earring back to Nonna. The vice president of the ballet school thinks Nonna should become a character dancer. Yuri Mironov disagrees with him. Yuri insists Nonna can become a danseure noble. He declares he will have Nonna dance La Sylphide at the Tchaikovski competition to prove he is correct. Karin tells Nonna she can't dance La Sylphide. Nonna asks why Karin thinks so. Karin ruins Nonna's outfit with a rouge. She takes Nonna to a clothes shop and buys new clothes for her. Nonna learns she doesn't think Nonna can dance Sylphide because Nonna looks childish. Karin takes her to a party. Nonna drinks there and gets drunken. Karin takes her to her place. In the night, Karin wakes Nonna up saying "Rosa, wake up.' Nonna wakes up and is surprised to know she didn't get back to the dormitory. Karin plays the piano when Nonna and Remir practice. Suddenly, Nonna's shoe strap cuts. Karin gets sick to see it and the vice president takes her home. Asia gives birth to a baby girl. On her way from the hospital, Nonna meets Karin. "How ghastly it is!" says Karin. "Parents have to see their baby repeat their life. I feel sick of it." Karin invites Nonna to drink tea at her place. Nonna asks her who Rosa is. Karin answers Rosa is her younger sister, who's dead. Rosa was a ballet dancer. She was pretty, small and slender. She looked like a fairy. She was good at dancing La Sylphide. Mr. Semyonov recommends Remir he shouldn't dance as Nonna's partner at the competition because La Sylphide is not very appealing to examiners. Remir says he wants to dance as Nonna's partner not only at the competition but also for the rest of his career. Yuri Mironov tells Nonna she should take advantage of the weakness of her mentality for dancing a fairy. Yuri Mironov dances at a special performance after the five month when he wasn't allowed to dance on the stage. His partner is a pretty ballet dancer. She sees Nonna dance La Sylphide and she comments that it looks cute and clean. Nonna thinks cute and clean fairy could be good. Karin says Yuri Mironov might be in love with the pretty dancer because she is superior to Nonna in every aspect. She says it's arrogant that Nonna is just waiting for Yuri's love without doing anything. "That's why you can only dance cute and clean fairy. You have to be more matured if you want to dance La Sylphide." says Karin. Nonna asks her how she can be more matured. Karin recommends Nonna sleep with Yuri Mironov. Nonna steals into Yuri's car, but she can't say anything to him. Nonna calls in Karin and stays at her place in the night. Karin tries to kiss Nonna in bed. Nonna tells her to stop. Nonna goes to Moscow to perform at the competition. She's given up being more matured. She thinks she can only dance in her own way. Nonna and Remir dance "La Fille mal Garde" at the first preliminary, and "Black Swan" at the second. Karin plays the piano for them. She tells Nonna the other piece of the pair of earrings that Karin gave to Nonna is under the ground with the dead body of Rosa. Karin and Rosa shared the pair. Nonna tells Karin she'll give it back to Karin. Nonna admits she is a cold person. Nonna thinks there can be an unmatured, cold and blue Sylphide. Just before "La Sylphide" starts, Nonna finds the bracelets nowhere. She always wore them when she practiced "La Sylphide". She gets so nervous that she bursts into tears crying, "I'll fail if I dance without the bracelets!" Yuri Mironov kisses her to calm her down. Yuri hands his necklace chain and Karin's pendant chain to Nonna and tells her to wear them instead of the bracelets. Yuri is satisfied with Nonna's La Sylphide. He thinks a fairy shouldn't be a human or a matured woman. The sound that the chains around Nonna's arms emit reminds Karin of Rosa. Rosa was wearing gold chains when dancing La Sylphide. While Nonna is dancing the solo part, Karin suddenly stops playing the piano. Nonna doesn't stop dancing. Yuri thinks it's the first time he sees something spiritual. He learns Nonna finally has got into the world of art, where nobody can show how to get, and she's found on the silent stage the true romantic ballet that is bluish and transparent. "It was really fabulous, Nonna." says Remir just after the stage. "I think so, too." says Nonna. Nonna ends up winning the grand prix at the competition. At dinner after the competition, the vice president says Karin came to the Soviet Union because her lover had died. He says her lover was a ballet dancer but killed himself because his Achilles tendon cut and he wasn't able to dance any more. Nonna is sure Karin's lover who the vise president is speaking about was Rosa even though the vise president thinks her lover was a male. Going back to Leningrad, Nonna gives the pendant chain and the piece of earring back to Karin. Karin says she had heard the sound of the chains at one time in the ballet school. She heard the sound from a studio. She opened the door and saw Rosa dancing for a moment. She has looked into the studio many times since then hoping to see her again. One day, Karin tells Nonna she's going back to Berlin the next day. She asks Nonna if Yuri Mironov has been nice to her after she got the grand prix. She says Yuri is going to dance with excellent ballerinas all over the world. Nonna begins to cry. Karin makes an apology and kisses her. Karin says she is in love with Nonna. Karin says Nonna is opposite to Rosa. Karin couldn't resist Rosa's attraction even though Rosa took away Karin's money, dresses, cars, jewels and so on. Rosa didn't love Karin. Rosa had a male lover, who was Rosa's dance partner. Rosa gave him everything that she took away from Karin. She was very happy that her "La Sylphide" was successful. Rosa's Sylphide looked attractive but her appearance and her mind had a gap. She practiced too hard and it caused her Achilles tendon cut. Her partner left her. "That's why she commit suicide?" asks Nonna. Karin says, "She had no intention of killing herself. She was sure I was going to save her if she told me she was going to commit suicide. One night, she gave me a call and said "Darling, I've just dosed sleeping pills to kill myself. Good bye." I didn't go to save her." Karin tells Nonna she's decided to take Nonna to Berlin and she'll shoot Nonna if she escapes from her. Yuri Mironov, looking them through the window, runs into the room to save Nonna. Yuri is shot by Karin. Yuri is taken to the hospital. Nonna isn't able to sleep for three days. Yuri is saved. The director of the movie "Arabesque" comes to see him. Yuri tells him he is happy Nonna wasn't shot and that he will marry Nonna as soon as he leaves the hospital. 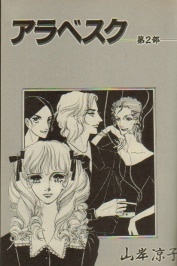 Bunko edition of "Arabesque" published by Hakusensha is in print. 2 vols for Part 1, and 2 vols for Part 2.